Barnes & Noble released some details recently showing that revenues are down almost 5% and so on. The overall decline in sales and profits has been the lede of this news so far. But one point that jumps out at me is worth mentioning (and lamenting). And that is the fact that Barnes & Noble bookstores are carrying fewer and fewer books every year. I feel frustrated every time I walk into a Barnes & Noble these days and have to navigate around the monolithic Nook base up front and then travel around all of the board games, toy figures and bobble-head dolls to get to… the fiction section. It’s that way in both the B&N shops here in town. Lots of people go to stores with a specific title in mind to buy, but how many bump into books while there? How many folks browse and stumble into a good book and buy it? This happens. I know this happens. It happens to me. But when you keep fewer and fewer books on the shelves it is going to happen less and less. I can only assume that on some spreadsheet somewhere it shows that the margin on toy figures is better than books. Which I’m sure it is. So the owner of that spreadsheet decrees that in the interest of chasing profits (which they do indeed need to do as B&N is hurting) they swap out books for non-book merchandise. Which probably gooses the bottom line a little. But over time bookish folks don’t get all that excited about visiting a B&N anymore. Another two seasons like the past two and it’s going to look like the toy and magazine/book racks at Target or Wal-Mart. So folks start directing book buying elsewhere and it starts to feel like a self-fulfilling prophecy. I know the book industry is crazy right now and margins on books have always been razor-thin, but the more Barnes & Noble goes down this path it really feels like it’s doing more damage than good. Am I off in my thinking? Anyone else see it differently? Last week Book Expo America 2015 was held in New York City. It’s an industry-only event best described as if a giant bookstore and Mardi Gras had a baby. Is that too weird? 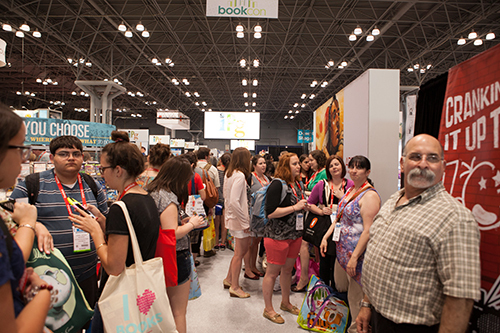 This year (as last) BEA backed up into BookCon. Which is an event for book fanatics, fans and the general public. It’s more as if a giant bookstore and a Hollywood red carpet had a child. If you like celebrity sightings then it’s certainly your cup of tea. 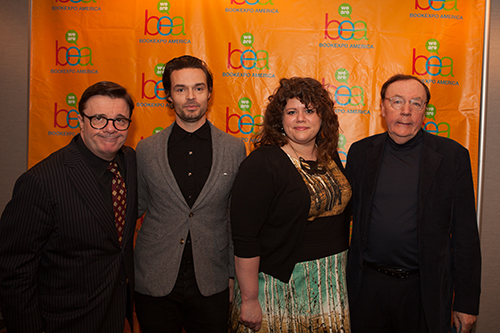 I didn’t get to go this year (all these photos are courtesy via BEA), but had a blast watching via the bookterwebs. If you know where to look you don’t have to dig too far before you virtually bump into an author or publisher you admire. The folks at Vulture did a good job of highlighting the big stories from some big personalities. Overall I think Judy Blume had the brightest spotlight, while Jason Segal’s take on (and as) David Foster Wallace is one of the most interesting. From the industry side of things I really enjoyed following The Bookseller last week and this write up on “readers first” and publishing trends was interesting. I don’t always agree with Joe Wikert, but his observations from this BEA is worth reading for all of the perspectives it offers. And then there were the parties. Oh. My. I won’t link to them all as I don’t want to loose my family-friendly rating. But one party had balloons. From the social side of things I enjoyed following the @beabloggers on twitter and the amazing community behind the Armchair BEA network. So fun. Lots of neat bloggers, books and personalities there. Not too mention it always feels good to have others to commiserate with when missing out. Let me know if you know of something I missed out on. I have so many links and articles to read through as I dig deeper into some really great reads coming out later this year. Maybe I can get through them all before BEA descends on Chicago in 2016.